Are you running a small business and looking for an easy to manage employee attendance? 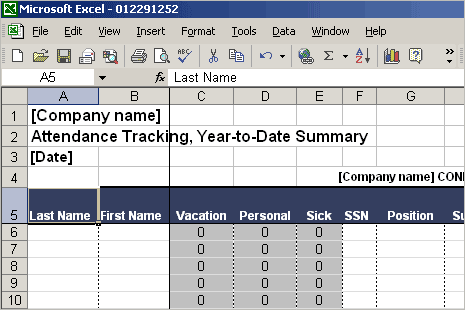 You can easily do the same in Microsoft Excel program by using employee attendance tracking template. Using this, you can track employee vacation, sick leave, personal leave along with other details like supervisor name, related dates etc. Microsoft website has fully formatted employee attendance tracking MS Excel template ready for download and use. Download this template and track employee attendance easily. You can further customize this template and add / remove tables. Check this article to create your own attendance tracking template. spreadsheetzone.com only has password protected files so stay clear.